Cart on casters that I built for the Clausing Colchester lathe that I bought. Each caster is rated for 2,400 lbs. The 1x4 planks are stapled to the 2x8 boards with 2 inch staples. 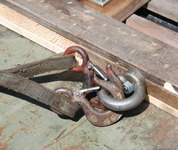 The casters are bolted to the cart with grade 5, 3/8" bolts. 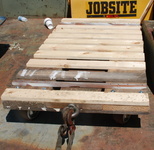 The cart is 30x60 inches, which makes it 6 inches wider, and 4 inches shorter than the lathe. 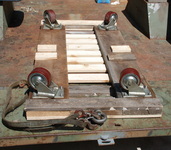 That will, I hope, enable it to hold the lathe securely and, and the same time, allow me to block the lathe and slide the cart underneath it. It has a lunette ring type attachment in front, that I made from an eyebolt.